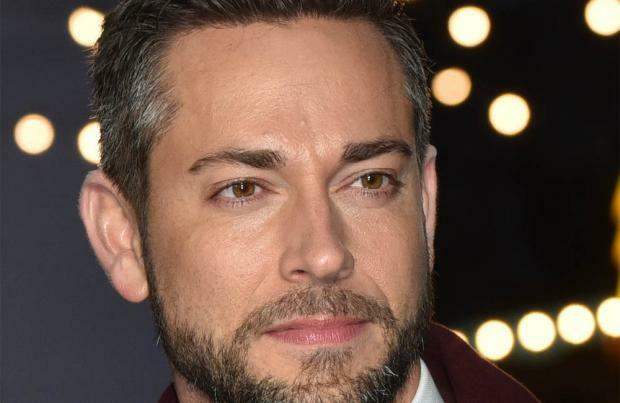 Zachary Levi wants the floss dance to "die a horrible death" after he had to do it in the 'Shazam!' movie. The 38-year-old actor is seen doing the dance move phenomenon in his role as the titular superhero in the latest DC Extended Universe film, however, he is not pleased that he will forever be seen doing the floss on screen and insists the "only flossing we need to do is between the teeth". Making a joke about the stereotypical perception that British people have bad teeth during a Q&A and screening of the movie at the BFI Southbank in London, Zachary said with a smile: "I don't like the floss I think that dance needs to die a horrible death. The only flossing we need to be doing from now on is between the teeth guys and you really do need to do that. I'm serious, this is England you know what I'm talking about!" The 'Chuck' star went on to insist that his role as Billy Batson – who is actually a teenager who is made the 'Champion of Eternity' after being bestowed his powers by an ancient wizard and can become a super-powered adult by saying Shazam – was "beyond surreal" and fulfilled a childhood "dream" of becoming a superhero. When asked what it was like putting on Shazam's striking superhero suit, he said: "Beyond surreal man. It was just like a dream. Ever since I was a little kid I dreamt of being a superhero. I think all of us can relate to that – at some point in our lives, we believe that we can fly we believe that the floor is lava and a lot of us, unfortunately, we lose that. You know life happens and responsibilities and then all of a sudden the little kid in me who always wanted to be a superhero got to be a superhero." Zachary stars in 'Shazam!' alongside Mark Strong as supervillain Dr. Thaddeus Sivana, Djimon Hounsou as The Wizard Shazam and Asher Angel, who plays the teenage Billy. The movie opens worldwide on April 5. Shazam! writer Henry Gayden to return for sequel?